Haven’t decided on a hotel yet? You can look at other available hotels in the Tuscany region with Booking.com. If you are interested in staying in a Tuscan villa, Booking.com offers a number of stunning properties. Dream of Italy and what comes to mind? Classic rolling countryside covered with ripening grapevines and olive groves, slender cypress trees along the lane leading to a villa or farmhouse standing alone across a field, and, of course, the enchanting medieval hill towns. 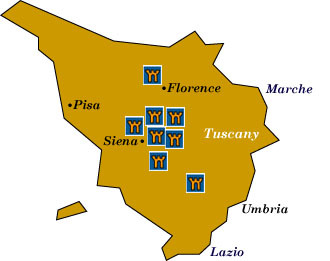 Tuscany is named after the Etruscans who settled the region around the 8th century BC. The Romans called the land Tuscia. After the fall of Rome, invading armies left the region in turmoil for centuries. People found tenuous security behind the walls of their hilltop villages, strategically placed where they could see any marauding army approach. By the 12th century, the Tuscan city states were well established, with Florence and Siena each vying for supremacy. The rivalry still continues today: Florence may have the artwork, but Siena transports you back to the Middle Ages. Florence Cradle of the Renaissance and home to Machiavelli and the Medicis, Michelangelo’s David and Botticelli’s Birth of Venus. plan on four days to just scratch the surface of this captivating, world-class city. The Uffizi museum overwhelms the senses with the masterpieces of Botticelli, Leonardo da Vinci, Michelangelo, Titian, and Giotto. Master of Renaissance architecture, Filippo Brunelleschi, left the world that famous red-tiled dome which graces Il Duomo, the crowning glory of Florence. The Palazzo Pitti (Pitti Palace), the former home of the powerful Medicis, is a treasure trove of Raphaels and Titians, second only to the Uffizi. Siena, the Gothic jewel of Tuscany, once rivaled mighty Florence in wealth and artistic prestige. For the most part, cars are banned from the center, giving the visitor and pedestrian a breath of fresh air. Spend an afternoon on the Piazza del Campo, one of the most pleasant squares in Italy and home to the biannual Palio horse race. The Palazzo Pubblico has brickwork and medieval crenellations that Sienese architecture is known for. Part of the Palazzo Pubblico, the Museo Civico (Civic Museum) is filled with artwork by masters of the Sienese school of painting and sculpture. Wander up the Via Banchi di Sopra and admire the aristocratic palaces which line the street. San Gimignano Despite the swarm of visitors that descend on this gorgeous hill town, that first glimpse of the skyline of fourteen towers soaring above ancient walls evokes the sense of the Middle Ages as much as any sight you’ll see in Tuscany. San Gimignano’s location on the Lombardy-Rome pilgrimage route gave rise to its wealth, as symbolized by its once 72 towers. Try to linger in town until evening; the tourist buses will have left and you can savor the elegance of its monuments with a bit more peace. Chianti Many a foreign pilgrim has come to Chianti and gone no further. Between Florence and Siena is a territory bathed in golden sunlight the year round; crenellated castles and Romanesque churches rise above rolling hills covered with olive groves and vineyards. As the name suggests, some of Italy’s most recognizable wine comes from this region. A blend of white and red grapes, Chianti Classico is sold under the Gallo Nero (Black Cockerel) symbol. Most wineries require advance booking before a visit. Cortona A winding road leads past terraced vineyards and olive groves to one of Italy’s oldest hill towns. Ancient Etruscan tombs are scattered throughout the area, while medieval buildings dominate Cortona’s steep streets that are blessedly free of cars. Magnificent views sweep across the Tuscan countryside. Take time to visit one of Cortona’s museums: the Museo dell’ Accademia Etrusca and Museo Diocesano are good ones. The Tuscan Hill Towns Pure enchantment, the hill towns of Tuscany are a peek inside a mysterious world from another age. It’s a hard to pick a favorite; each is so special in its own right. In addition to the one’s listed above, a few that are worth searching out are Montalcino, known for its excellent wine, Brunello di Montalcino; Montepulciano is built on a long, narrow ridge with incredibly steep streets, tempered by numerous cafes and wine shops; the amazing Etruscan town of Pitigliano grows out from a volcanic outcrop, with gorges that surround three of its sides and a fortress on the fourth side. Lucca Often overlooked by the tourist throngs, Lucca is a delightful town that was an independent republic for nearly 500 years. Imposing Renaissance walls—among the finest in Europe—enclose the old town. The 11th-century Duomo (Cattedrale di San Martino) is the town’s main monument and features the tomb of Ilaria del Carretto, the masterpiece of Sienese sculptor Jacopo della Quercia. In addition, the composers Luigi Boccherini and Giacomo Puccini were born here, and their works are performed in concert at the 19th-century Teatro del Giglio. Pisa The Campo dei Miracoli, or “Field of Miracles” is a gorgeous setting not only for its famous Leaning Tower, but for the Duomo, Baptistry, and Camposanto, in which are highlighted the few wonderful frescoes that survived the bombs of World War II.